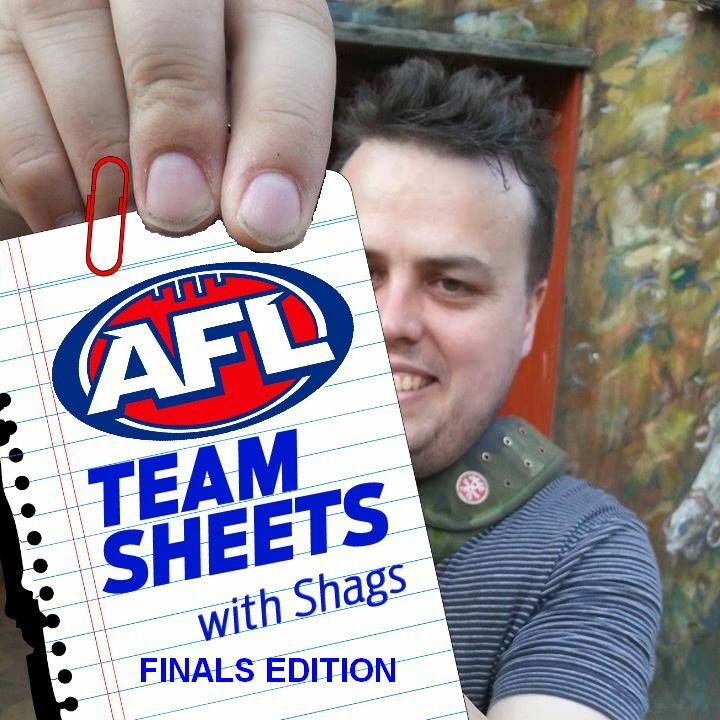 All our finals teams are in! Make sure you check late changes for each match for your matchday teams! All the remaining round finals teams are in! Scott Selwood is in for Cats and could be a bit of a Matchday smokey, and Ben McEvoy is in for hawks, and could be an option for ruck for that match. Rising star Callum Mills is in for swans, and is definitely a def option for the swans. Big ins for Crws with Brodie Smith, Rory Sloane named. Six changes in all across the clubs. Well, our DT seasons are over, and may of us have had the DT equivalent of mad monday. The ACTUAL finals are on, and even though the main DT comp is over, there still exists the possibility of making the finals campaign a bit more interesting. Feel free to join my Matchday Finals League (Shags DTTalk Finals League) code UVZ7C4FE if nothing else but a bit of a laugh over the finals campaign. Our first big game is Eagles vs Dogs on Thursday night, and it’s gunna be a ripper! There are some important ins this week with Doggies throwing caution to the wind with inclusions of Jack Macrae, Tom Liberatore and Easton Wood as was reported to be the case during the week. Roughead, Wood, Liberatore, Stringer, Macrae for Minson, Stevens, Roberts, Hrovat, Williams. With Matchday you can afford to take a punt on a few smokeys and not your usual consistence mainstays. Luke Shuey has gone massive quite a few times this year, and the gambler in me is going to take a punt this week. His form leading into the finals has been very impressive with a 3 round average of 115. For the doggies, I can’t go past Def mainstay Jason Johannisen who has been in stellar form leading up to the finals. McEvoy, Stratton for Hartung, Pittonet. Captain obvious call, with brownlow in the bag no one would criticise you for putting Patrick Dangerfield in your matvhdaay team and putting captain on him. For hawks throwing in a bit of a smokey with Bredan Whitecross, who hasnt scored huge but has been pretty consistent, and could easily be a good choice in your defence. The swans midfield is full of talent, but i’m going with Star Luke Parker who missed out on last years finals campaign and will be rearing at the bit. I reckon hes as likely to huge as anyone. For my GWS player, Im going with Toby Greene to slot in our forward lines. He has had a very good year and earnt his all Australian selection. DT wise he is very up and down, but Im going with up this week with the excitement of the finals! Sloane, Smith in for Henderson, Ellis-Yolmen. Rory Sloane is a huge in for the crows. in their last game against the eagles they really missed the gun midfielder. As such you’d expect him to be making up for it this finals. In matchday its great to be able to grab a main midfielder in forward line in Daniel Wells who was seen for many as almost a keeper rookie priced player this year. with most of the other choices being actual key forwards, Wells is a pretty safe choice. Anyone interested in NFL Fantasy over the summer drought of AFL Fantasy?